"A stylish, affordable purchase for every home." "The style is unbeatable; marble is a hot trend, so this coffee table will instantly become a statement piece." "A rustic-yet-industrial look that won't seem outdated in a few years." "Vintage-inspired, with bronze brackets and deep, rich-hued wood." "A classy piece that provides utility as well as beauty." "Super-sleek and all but screams 'glam.'" "Perfect for airy spaces and light-colored living rooms." "Adds sleek storage space for books and magazines." Simple, elegant and traditional, the Simpli Home shaker coffee table is a great choice for tastes of all kinds. This table comes in six colors and is constructed from solid pine, so you don’t have to worry about splitting or cracks. We love this table because it’s neutral enough to fit into any decor style and affordable enough that you’ll have money left to splurge on that new TV you’ve been coveting. The table has two functional drawers that can be used to store remote controls, board games or any other knickknacks. The Simpli Home shaker table is rectangular in shape and runs 48 inches wide, so it’s the ideal size for both large and small living spaces. Reviewers say that assembly is a breeze, and many have also used it as an entertainment center. To protect the finish, we recommend rubbing furniture paste wax across the top if you’re an “oops, I forgot the coaster” type of person. All in all, the Simpli Home shaker coffee table is a stylish, affordable purchase for every home. If you’re looking for an incredibly stylish and trendy coffee table that costs less than that new pair of jeans you splurged on last month, this Sauder coffee table is for you. This rounded rectangular table has a faux marble finish on top and engineered wood legs, but reviewers say the quality is a lot better than you’d suspect from a piece of furniture with such a low price tag. The style is unbeatable; marble is a hot trend, so this coffee table will instantly become a statement piece in any living room. At 50 inches long, the size is standard; the table should fit nicely into any larger living room. Add a few great coffee table books and fresh flowers, and this Sauder table will add a hint of chic to your space. 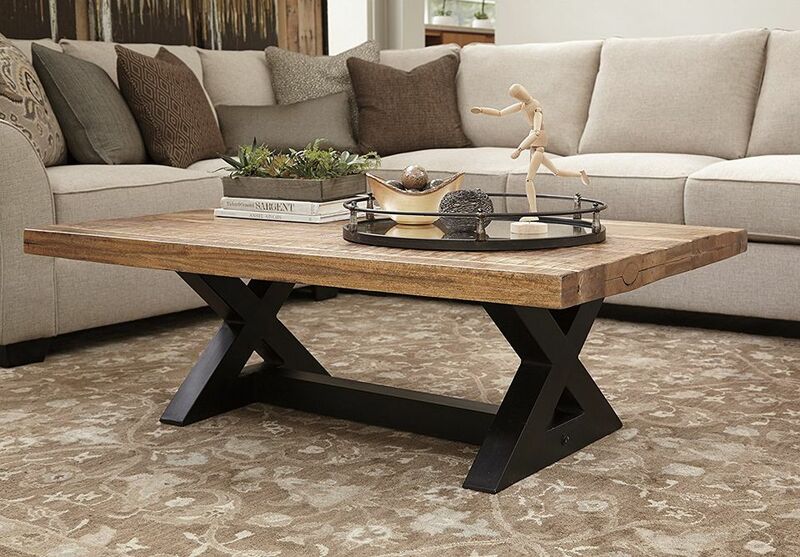 A great coffee table can last for years, so if you’re looking for a piece that won’t fade quickly, this Ashley Furniture Wesling table is a great choice. Crafted in solid wood with black X-style legs, this coffee table has a rustic-yet-industrial look that won’t seem outdated in a few years. At 54 inches long, the Wesling table is a little wider than other choices on this list—and at 108 pounds, a little heavier. A solid, well-made piece, it’s a great choice if you want to spend a little more for higher quality. Reviewers rave about the sturdiness of the materials and the elegant design, agreeing that they all receive compliments on this addition to their living room. If you have a larger space that can easily fit a larger coffee table, the Ashley Furniture Wesling table is a great choice for your home. Sometimes a coffee table just doesn’t provide enough room for your family’s epic spread of popcorn, soda and snacks on movie night. A matching coffee-and-side-table set can be a great way to add a lot of surface space without spending a fortune. This Ashley Furniture Murphy set comes with three stylish matching pieces, so you don’t need to worry about finding side tables that complement your other furniture. The set is vintage-inspired, with bronze brackets and deep, rich-hued wood. It’s neutral enough to fit into any living room, but chic enough to make a statement. The coffee table is 46 inches long, while each end table runs 20 inches side-to-side. While the Murphy set is made out of veneer and engineered wood, reviewers say the quality looks far more expensive. They do note that the set has a strong chemical smell when it’s first set up, but allowing it to air out on a porch or in a basement will solve that problem. A coffee table with maximum storage is a great way to hide bedding, throws, pillows or other things you can’t fit in a closet. This Augustina coffee table is perfect for those small spaces or living rooms that double as guest rooms, where closet space is limited (or nonexistent). The lift-top mechanism easily hides clutter from your guests’ view— and unlike a standard trunk, has multiple compartments that can be accessed without clearing off the top. The Augustina table is sturdy, made from solid wood with rustic metal accents, weighs nearly 100 pounds and is 43.5 inches wide. And the best part? It comes fully assembled, saving you an afternoon spent searching for screw drivers and lug nuts. Owners agree that the table is a gorgeous addition to their living room, praising the quality and craftsmanship that is sure to last for years to come. This is a great choice for a buyer who is looking for a classy piece that provides utility as well as beauty. Not all coffee tables come from the same mold—and while many popular choices are rectangular, a round piece can be a great alternative. This Sauder table is super-sleek and all but screams “glam.” With a safety-tempered glass top and thin gold trim, it will make your living room feel like a high-class Manhattan hotel (in the best way possible). The table is 36 inches wide and weighs only 31 pounds, so it’s a great choice for a smaller living space. We love round coffee tables in formal sitting rooms or paired with a modern sectional to lend an eye-catching contrast to sharp lines. Reviewers adore this piece, agreeing that it’s light and airy enough to add style to a space without overpowering it. While you may want to avoid throwing your feet up on this table due to the delicate glass, owners say it feels sturdier than it looks. If you’re an “out of the box” type of decorator, there’s no need to buy an ordinary coffee table that doesn’t fit your style. Crafted with a 15mm-thick tempered glass triangular top and solid wood legs, the Poly and Bark coffee table is a replica of designer Isamu Noguchi's mid-century style. Its minimalist approach to bringing nature into a home is perfect for airy spaces and light-colored living rooms. The table is 50 inches at its widest, weighs 99 pounds and will be an instant conversation piece in any living room. Mid-century is huge in the design world right now, but if sharp lines and tapered legs just aren’t your thing, this Poly and Bark table is another great way to add a touch of that coveted “Mad Men” style. Owners say they’re constantly complimented on this piece and agree that it’s a great way to add a lot of style on a small budget. Whether you’re a college student with a small common area or you’re looking to add a bit of storage and surface area to a compact living space, this ClosetMaid coffee table is a great choice. Made from laminate and powder-coated metal, this coffee table adds a bit of sleek storage space for books and magazines as well as a 39.45 inch wide top for drinks and TV dinners. The modern contemporary design goes with most furniture and can be easily decorated with books and trinkets to fit all tastes. We love how neutral this piece is; it only stands out if you want it to. If you’re simply looking for a functional piece that doesn't overpower a room, ClosetMaid’s coffee table is a great choice. Reviewers say assembly is easy and add that it works well as an entertainment stand as well.